Before there were Nikon cameras, there was NIKKOR, the precision optics company that predated the first Nikon camera by over a decade. As Nikon cameras evolved, pushing the boundaries of imaging possibility, NIKKOR lenses were always there—the unwavering, supremely articulate eyes of Nikon. 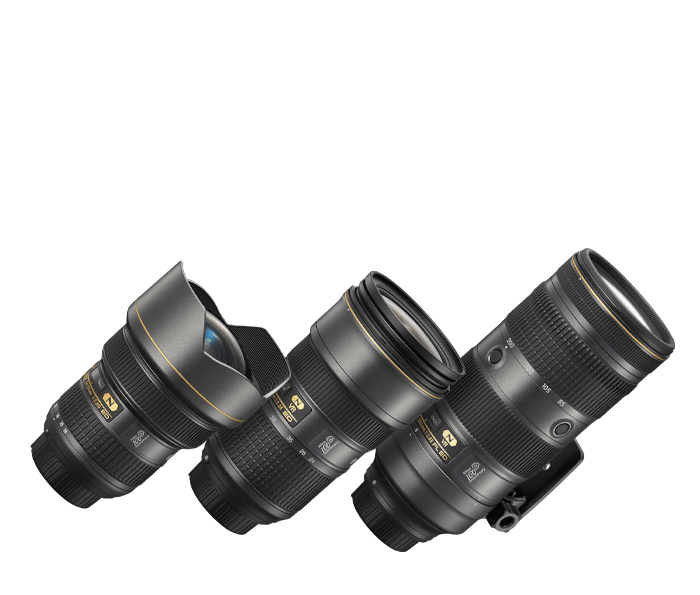 To celebrate 100 years of innovation and excellence, Nikon proudly presents three of its most prized NIKKOR zoom lenses together as a limited commemorative set. Featuring special 100th anniversary designs, all three lenses have matching serial numbers and arrive in a custom metal travel case engraved with that same serial number. Individually, these lenses each represent an optical masterpiece; as a set, they represent one of the most powerful, exciting lens kits ever assembled. The ultimate ultra-wide-angle zoom. Covering from 14mm to 24mm with a fast f/2.8 fixed aperture, this is essential glass for serious photographers who demand the best photos and HD videos. Praised for its versatility, reliability and outstanding image quality, this is a favorite lens of passionate professionals. With a fast f/2.8 fixed aperture across a 24-70mm zoom range, it produces exceptional sharpness, contrast and color rendition in nearly any light. The benchmark for fast telephoto zoom lenses, unrivaled for low light, sports, wildlife, concerts, weddings, portraits and more, this lens is a mainstay for so many photographers around the world. It covers the 70-200mm focal length range with a fast f/2.8 fixed aperture and produces photos and videos in a class of their own.